You can score a look from Oscar de la Renta’s Fall 2013 collection right now. And without breaking the bank. Well, at least part of a look – the nails! The designer’s second line of nail polishes, inspired by his Fall 2013 fashion collection and mixed up specially for the runway, went on sale immediately after his New York Fashion Week show yesterday. 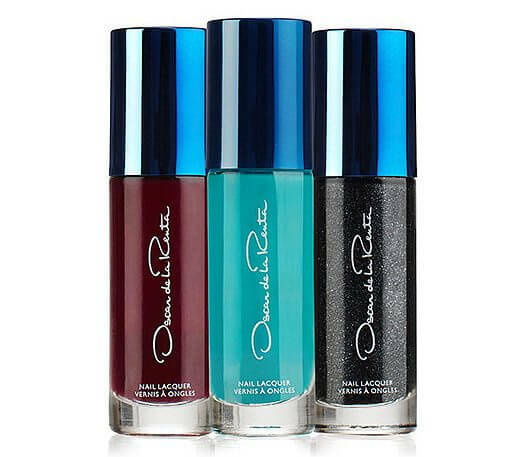 The three limited edition shades – Asphalt, an edgy yet sophisticated charcoal grey with shimmer; Dare, an island-inspired teal; and Covet, a rich mulberry – can be ordered at oscardelarenta.com for $22 each. I have a feeling these lovely lacquers will be flying off the site super-fast, so click-through to buy yours right now. After all, it’s never too early to get your cool weather colour combinations squared away!